The day started in the vicinity of Gosforth Park, to set a Grey Squirrel trap, as part of a collective effort to protect the Red Squirrels of Newcastle. 30 Fieldfare, 20 Redwing, 1 Mistle Thrush and a few Chaffinch fed in the field before I entered the woods. The ground was littered with tracks, a lot of people movement and dogs, but a good number of Roe Deer and Badger tracks could be seen amongst them. 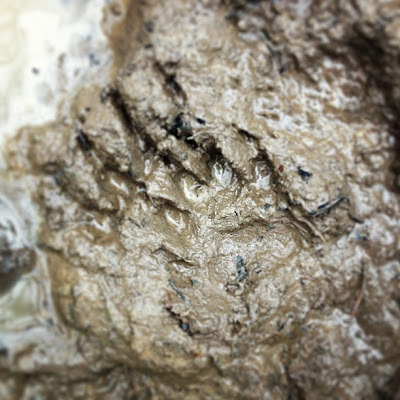 You can see the Badger's forefoot here, with the hind foot-print on top but slightly behind. I had a few bits and pieces to do during the day, but ended up heading to Holywell for about 15:00. 120+ Lapwing and about 40 Curlew were feeding around the pool visible from East Grange. Heading down to the hide I bumped into a local Birdwatcher and was pleased to hear there was a Drake Pintail on the pond. Opened the shutters, no sign of the Pintail, but the birds on the pond were uneasy, 10 Snipe and 2 Dunlin were in the air, along with the entire Lapwing and Curlew flock heading high, the Gulls were voicing their disapproval as were the Teal and Mallard, there was Peregrine about. Out the corner of my eye I caught sight of it, flying low just above the hide, a Tiercel. For a brief few seconds it showed unbelievably before it drifted behind, and out of sight, its presence still causing disturbance for the rest of my time there. On the pond, 2 Cormorants sat on the posts, 9 Teal, 9 Tufted Duck, 9 Mallard, 8 Gadwall, 6 Coots, and 1 Grey Heron sheltered by the reeds, a lone Shelduck braved the open water and 6 Moorhen fed in the feeding station. Wandering across the rest of the patch I had a single Woodcock, 60 Fieldfare over the Dene and 2 Red Legged Partridge in the Horse Field. But the Pintail still eluded me.